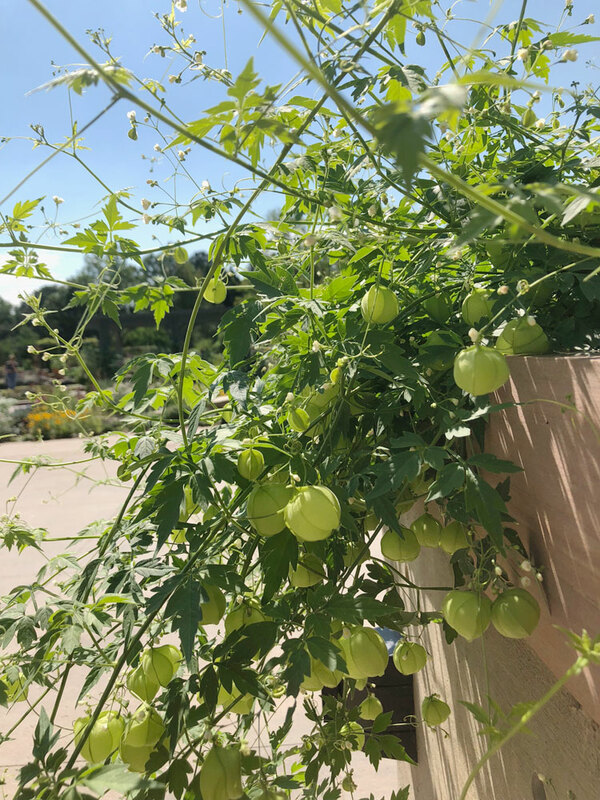 August, during the "dog days" of summer, is the perfect time to view all the fantastic annuals at Denver Botanic Gardens. During this time, annual flowers are at their peak, revealing their mature height and showy blossoms. This walking tour highlights some of the more unusual annuals the Gardens has to offer. These plants’ strange and odd qualities rival any shockingly bright blossom of a traditional annual flower. Begin your walking tour at the lowest point in the Sensory Garden. Near the tranquil water feature, you will see a living wall that is planted with an array of plant delights. In these wooly pockets that allow one to plant vertically, you will find a peculiar annual flower. This yellow button-shaped blossom has a red spot on the top giving it the common name of eyeball plant. 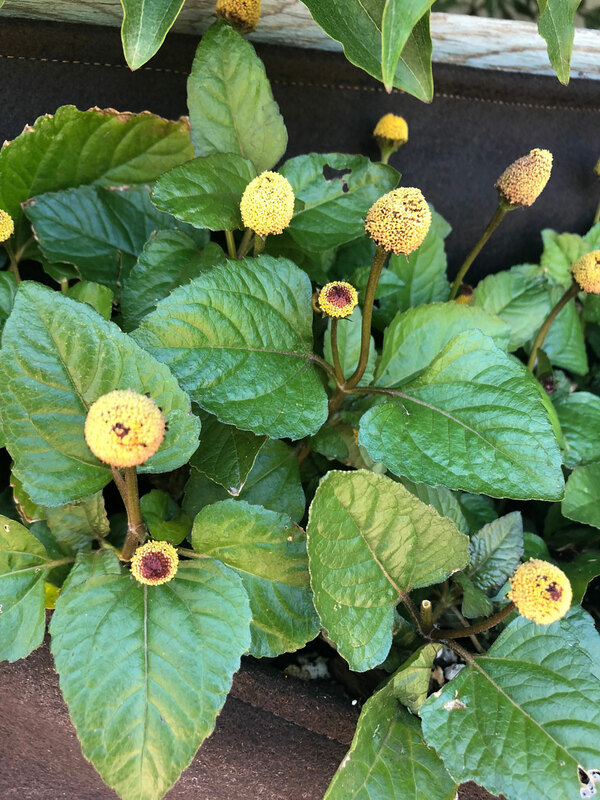 What’s curious about this plant, Acmella oleracea, is when the flower or leaves are chewed, it causes numbness in the mouth, and a tingling sensation on the tongue. It is an herbal remedy to treat toothaches, giving it another common name, toothache plant. Look just below the row of toothache plants and rest your eyes on a pink powder-puff shaped flower. 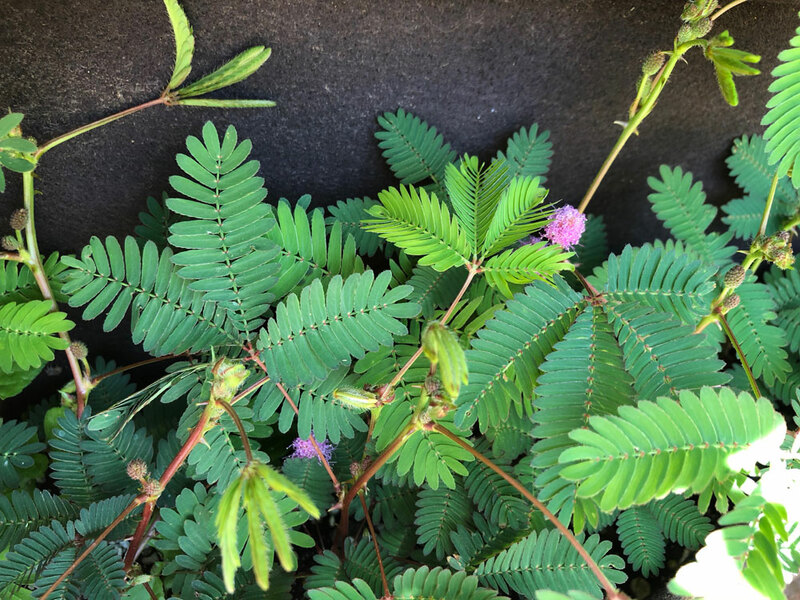 Something unexpected happens when you touch the green compound leaves of sensitive plant, or Mimosa pudica. Also known as touch-me-not, it becomes “alive” and closes its leaves over the stem. This almost extraterrestrial movement is an example of plant adaptation to protect itself from environmental harm or from predators. Now walk westward and find yourself outside on the plaza of Marnie’s Pavilion. Continue to walk west and find the walkway lined with citrus trees. Here the West Terrace planters are adorned with an annual flower display of warm tones of orange, burgundy and russet. 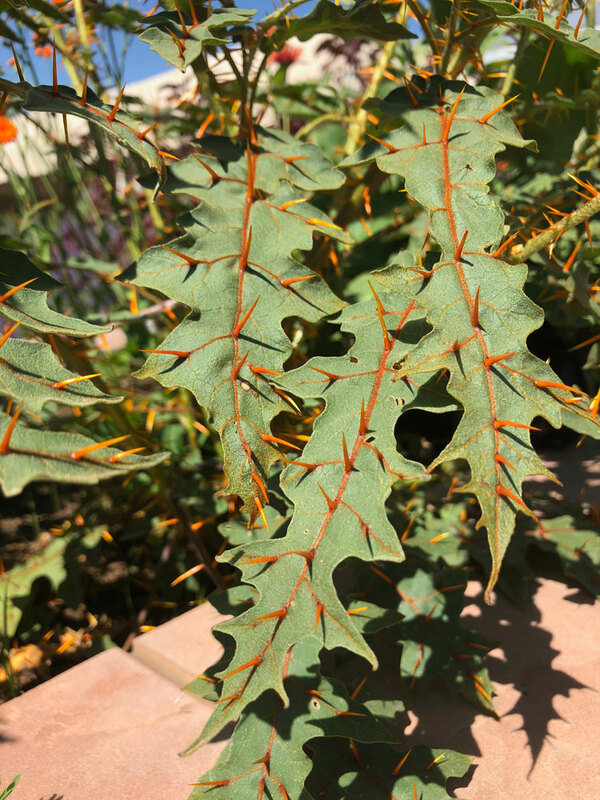 Here you will find a bizarre specimen plant with jagged, silvery-green leaves holding bright orange spikes decorated with purple flowers. This Madagascar native is called Solanum pyracanthum, or devil’s thorn. Its freakish display of armor reveals in the language of plants that it is poisonous. Towards the northwest end of the planter, you will find a trailing vine with small insignificant white flowers. Cardiospermum halicacabum, or love-in-a-puff, holds a secret surprise inside its papery round lanterns. Inside are three, dark bean-like seeds with a white heart-shaped spot on the top. The genus name Cardiospermum is derived from the Greek language meaning “heart shaped”. Now turn to the east and double back to end your walking tour at the Science Pyramid. Flanking the main entrance on the east side are clusters of container plantings full of wild and avant-garde annual flowers. 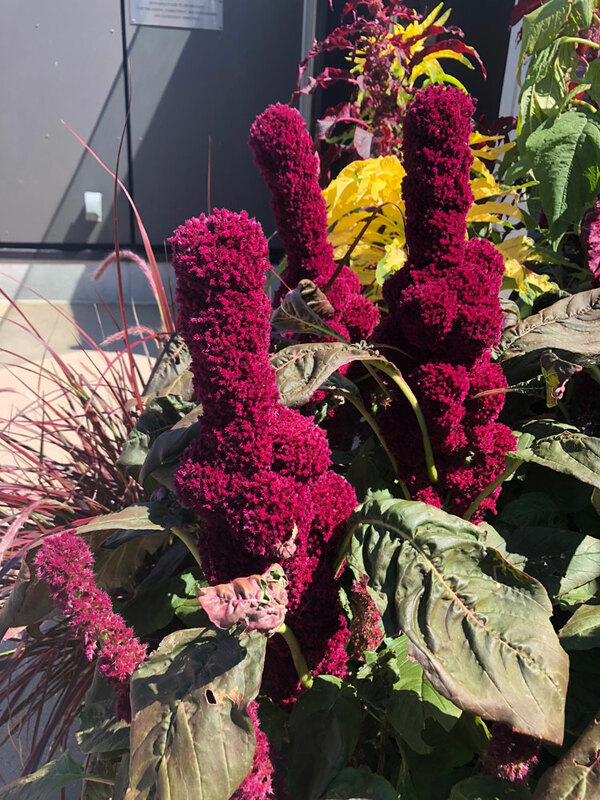 It’s easy to spot the dark purple, almost comical inflorescence of Amarnthus tricolor, also known by its common name elephant head amaranth. The flower head resembles an elephant with a protruding trunk. This modern day fetish for fertility, phallic in form, is said to bring quick pregnancy to a bride if carried in her wedding bouquet. 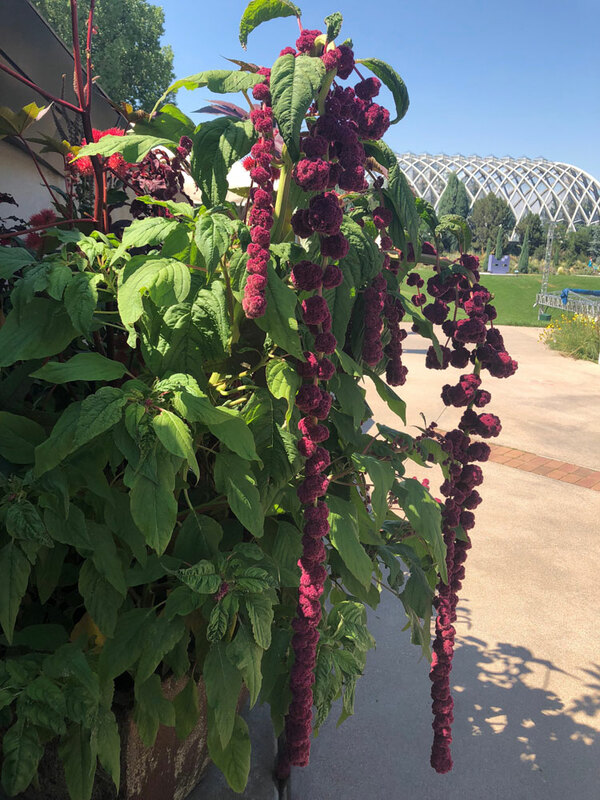 Juxtaposed to the towering elephant head amaranth is A. caudatus ‘Dreadlocks.’ The exceptional inflorescence of this amaranth is aptly named as its fuzzy pink dreadlocks cascade to the ground. These are just a small sample of the remarkable and unfamiliar annuals planted at Denver Botanic Gardens. These more obscure varieties are just waiting to be discovered. Perhaps you’ve been inspired to create your own garden of curiosities for next season.